The 1999 World Cup was played with one Dukes ball per innings, with field restrictions for 15 overs, and matches going into a reserve day if unfinished on the first day. 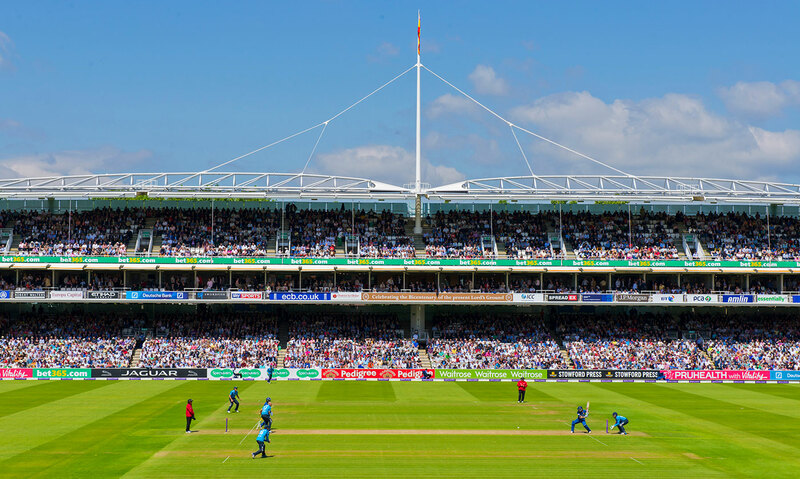 The next World Cup in England, 20 years on, will be played with two Kookaburras per innings, three different kinds of field restrictions, and the option for players to challenge umpires' decisions. Let it sink in for a moment. Hardly any sport gets tinkered with as much as ODI cricket. Some of it was necessary. Until as recently as the 1996 World Cup, a no-ball penalty didn't add to the runs accrued off that ball. Some of it was just gimmickry, like the Supersub. The ICC has found a cure for the white ball getting discoloured after 30 overs or so, but reverse swing has been lost in the bargain. In looking to beat the predictability of the middle overs, the first ten overs of ODIs have become predictable. Then, T20 cricket has changed mindsets and attitudes. Players and teams have striven to respond to every challenge and change thrown at them. 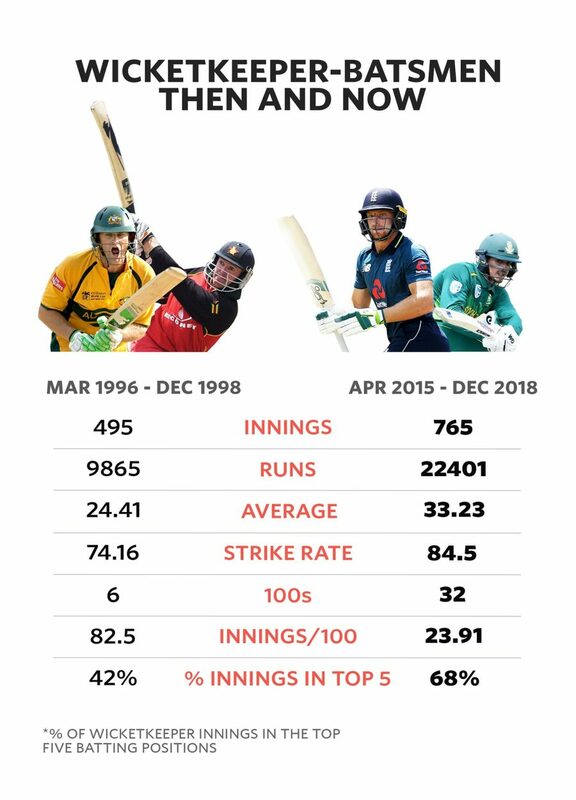 This is an attempt to look at how ODI cricket has changed since its showpiece event was last played in England. We have regarded periods between World Cups as discrete phases because the tournaments tend to be the culmination of periods of experimentation; soon after a global tournament there are new experiments and new playing conditions. We have not considered ODIs before the World Cup in a World Cup year because sides tend to experiment too much, which distorts any gleanings; for example, this year India went to New Zealand and kept batting first in conditions in which they would rather chase in the World Cup. The unhealthy influence of the toss in T20 cricket has created an impression that chasing is the way to go in ODIs as well. This feeling is enhanced when you see bigger scores being gunned down more often, but has it really become any easier to win chasing over the years? 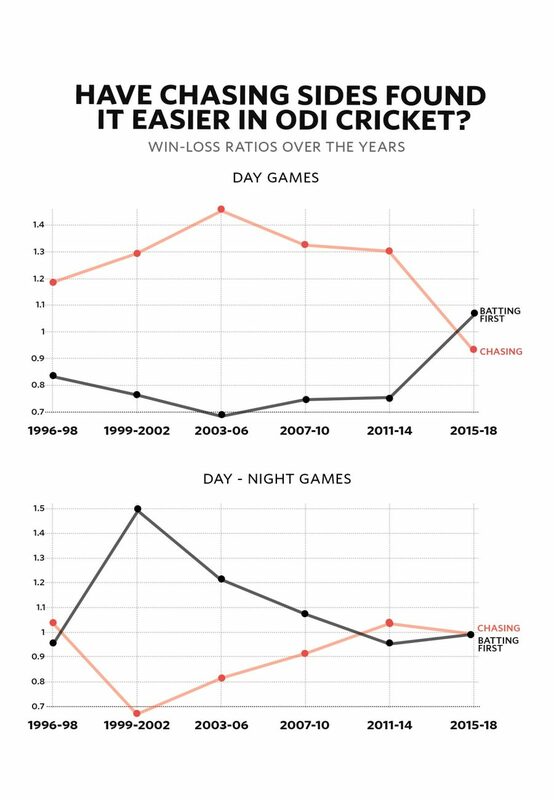 Turns out 50 overs is a long enough time to allow for conditions to change over the length of the game for there to be an advantage in batting first, even in day-night cricket. In fact, an equal number of day-night matches have been won batting first as batting second in the period between the end of the 2015 World Cup and the end of 2018. Interestingly, chasing sides enjoyed an advantage between the 2003 and 2015 World Cups, but in the last period it has been pretty even. Accordingly, teams chose to bat first only in 29.61% of day games in the years since 2003 leading up to the 2015 World Cup. 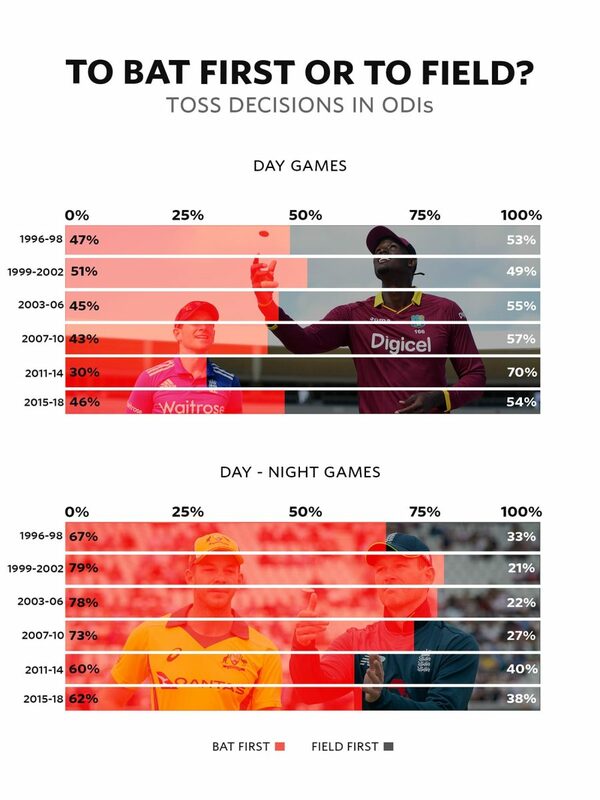 Teams have preferred to bat first in 61.86% of day-night games just before this World Cup. 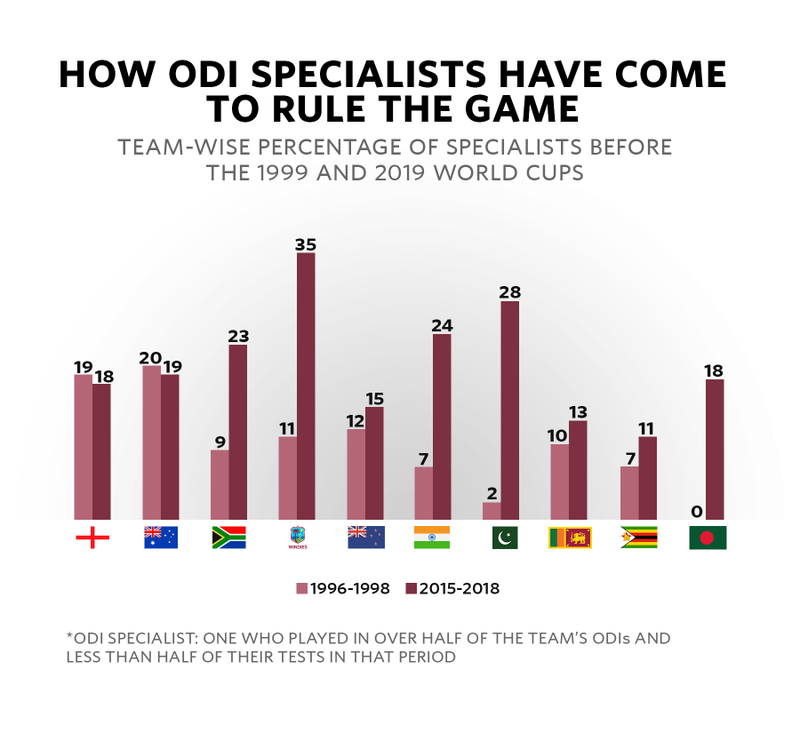 With an extra format added, the amount of cricket played has increased, as has the percentage of ODI specialists. However, England, Australia and New Zealand were picking such players even before the 1999 World Cup (remember the Four Horsemen of the Apocalypse: Matthew Fleming, Adam Hollioake, Mark Ealham and Dougie Brown?). It's India, Pakistan, West Indies and South Africa who have caught up late. Four, what is it good for? Scoring rates have gone up mainly through sixes. Between the 1999 and 2003 World Cups, one six was hit for every eight fours. Now a six is hit before five fours have been sent to the boundary. While fours per match have gone up from 35 to only 40, sixes have doubled from four per game between 1999 and 2003. 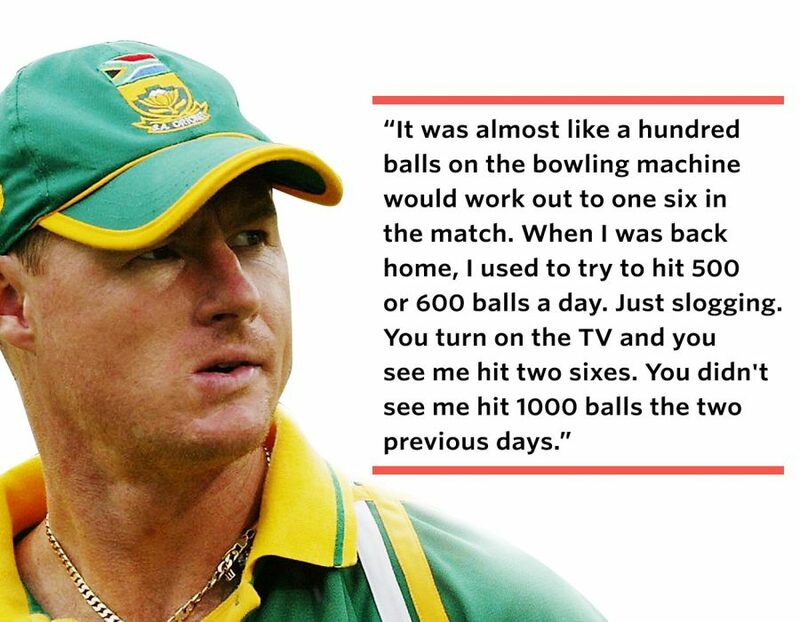 Lance Klusener was probably the pioneer of six-hitting. He practised to hit sixes, and just that. Bowlers are resilient. They come up with ways to counter batsmen's ever-increasing dominance. One of these is the increased use of spin with the new ball. We have accurate data for this from 2003 onwards. It is unimaginable today, but between the 2003 and 2007 World Cups, spinners bowled, on an average, 1.6 balls in the first ten overs of a match. Now they are bowling 14. Not only have spinners become more influential over the years, natural selection has forced them to add mystery to what they do, either by way of innovative actions or wristspin. Let's look at the ICC rankings at the end of each year before World Cups since 1998 and see how many and what kind of spinners there have been in the top ten. When it comes to pace, left-arm quicks make a big difference, especially in tournament play. 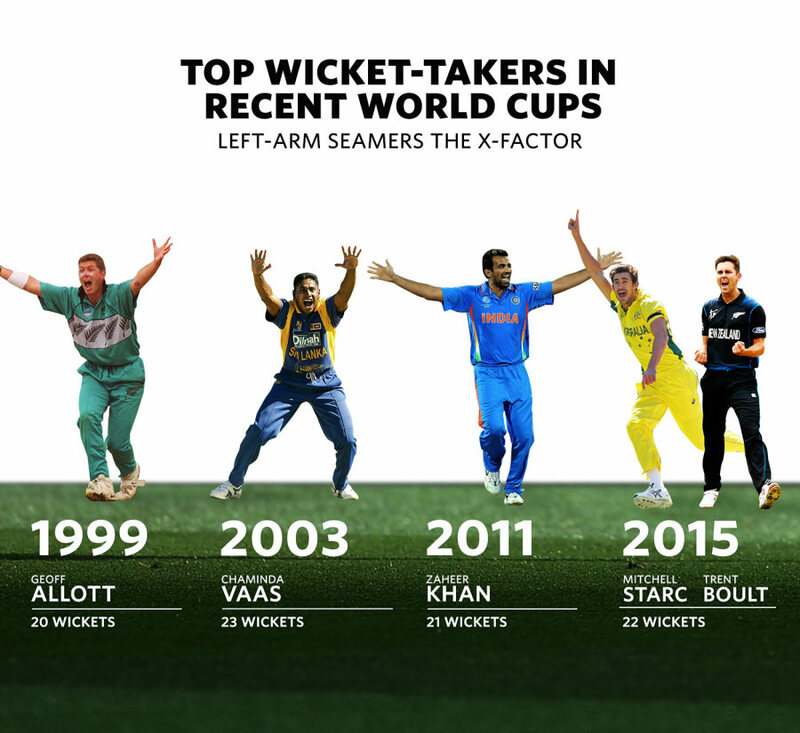 The leading wicket-takers in four of the last five World Cups are left-arm fast bowlers. The success of five of the last seven champions has been built around a left-arm quick: Wasim Akram in 1992, Chaminda Vaas in 1996, Nathan Bracken in 2007, Zaheer Khan and Ashish Nehra in 2011, and Mitchell Starc in 2015. 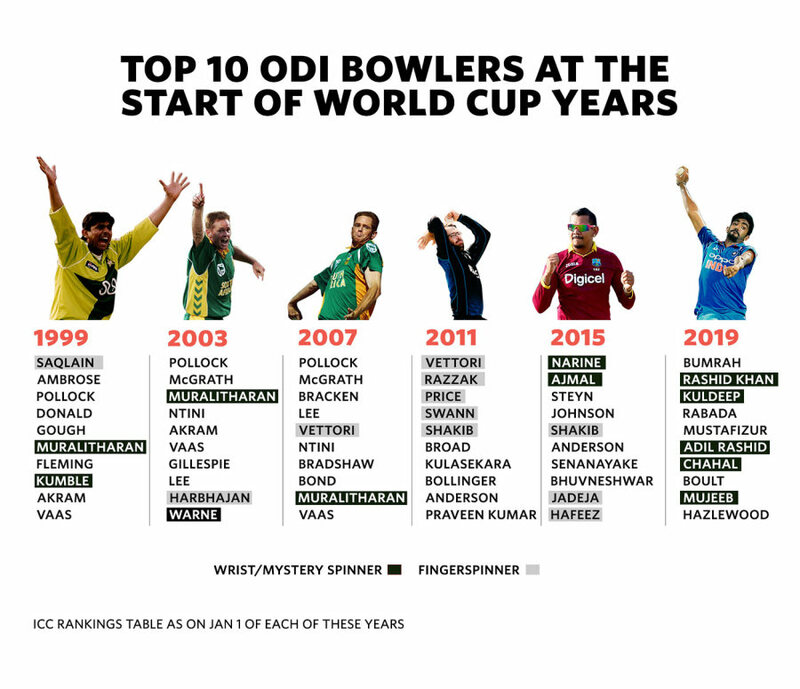 All the big teams in the 2019 World Cup have a left-arm fast bowler, except India, who did try for a long period in the lead-up to the event but couldn't find one they could take to England. Spin is used less at the death but it hasn't stopped bowlers from using spinners' wiles. 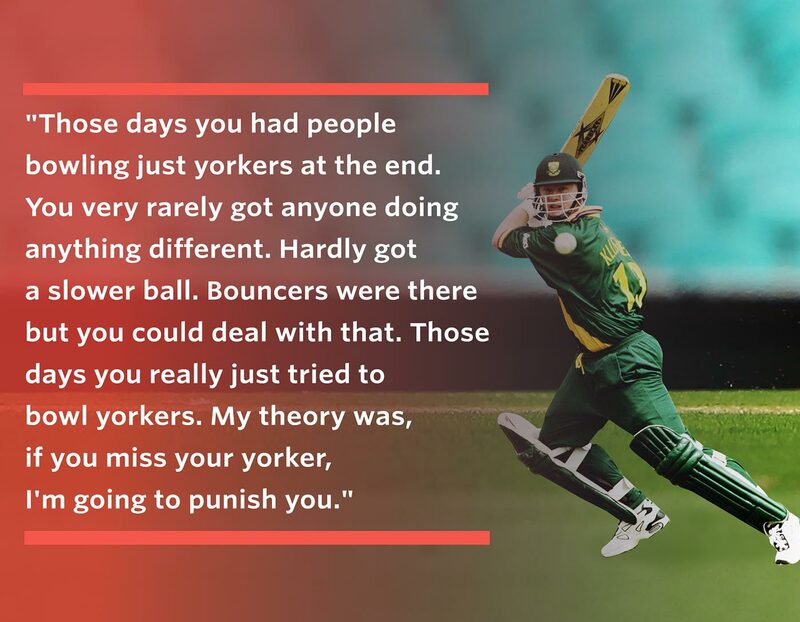 There was a time when batsmen only received yorkers. It is not that predictable now. … something goes wrong, right? Wrong. South Africa's wicketkeeper at the 1996 World Cup was Steve Palframan, with zero centuries in 125 List A matches. You won't see a wicketkeeper with so little batting pedigree in ODI sides today, even as an emergency replacement. How good are the best batsmen? There has been a subtle change in the role of the best batsmen over the years. There was a time when they were not only doing the heavy lifting but were also scoring the fastest. Then the accumulators began to rule the runs chart, but the trend has now gradually shifted back to the most prolific batsmen also being the leading aggressors again. 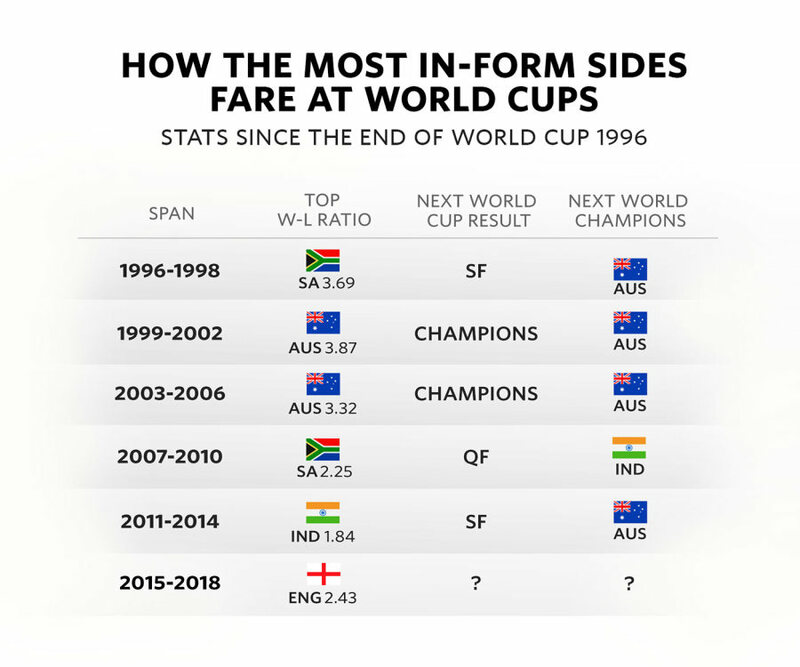 Do the most consistent teams in the periods leading up to World Cups go on and win - or do well, at least - in World Cups? The sample is not that big, but for what it is worth, this is what it is. Who plays the most cricket?